We’ve mastered the processes and tools to get your project right. To ensure your print files are right before they go on press, each file is checked and signed off on by three ACG team members before they come to you for proofing. Abbott Communications Group is a certified G7 Master printer. This certification shows our continued dedication in providing the best printing services in Orlando and the surrounding Central Florida area. The design and production workflow is distributed across many different systems made up of devices from different vendors. Because each device reproduces color differently, the color you see at one stage of design and production rarely matches what you see at another. In other words, color is device-dependent—the color you see depends on the device producing it. An open color management system that can communicate color reliably between different devices and operating systems is required. The open color management tools we use at Abbott lets us compensate for the differences in these devices and communicate color in a device-independent manner. How Does Color Management Work? A color management system uses a device-independent color model as the neutral color language by which all color information is referenced. Color varies depending on the device that produces it, with each device having its own “color language.” As a project makes its way across printing devices, color management is the process that “speaks” each language and interprets them so that the desired color is achieved in the end. 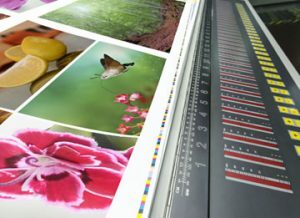 Prinect Inpress Control automatically measures and controls color and register on the fly and at any speed. Integrated directly into the press, the measuring unit measures colors and register every 16 sheets. Any corrections required are forwarded directly to the Prinect Press Center for adjustment. Most presses have a color scanning outside of the press and on average one sheet is scanned per 500- to 1000-sheets run. The Prinect Inpress Control means accurate color and consistency, especially on crossovers, throughout the print run.